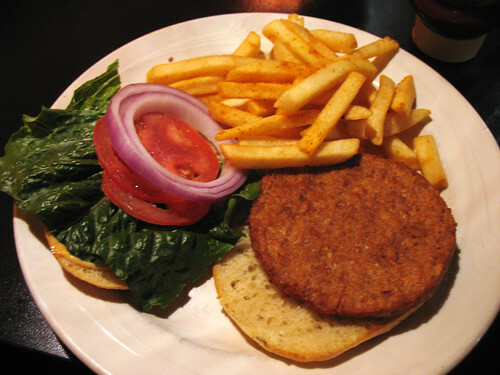 I'm back from the holidays, very excited for the fresh start of a new year, but my first veggie burger post of 2012 is going to be a nostalgic one: one of the earliest veggie burgers I ever ate at a restaurant, back in Virginia where I grew up. Going out to dinner at a restaurant was a rare and special treat with my family, growing up. Living in NYC now, I’ve become accustomed to a lifestyle where it is much more common, for better or for worse (we have so many restaurants to choose from in this city! It’s impossible to resist, although my bank account would probably be better off for it if I did). 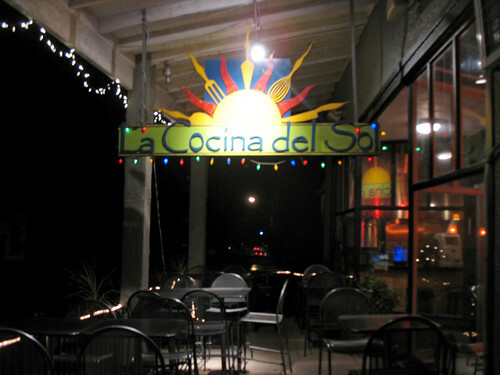 But even as infrequently as our family would go out to eat, I remember going to La Cocina Del Sol quite a few times. They first opened the summer before I left for college, but it became one of our favorite places to go out to dinner whenever I was home for holidays or a summer break. I liked this place especially because they served one of the better veggie burgers that I remember eating as a teenager. I hadn’t eaten there in over two years, so when I visited my parents this year for Christmas, I wanted to go back and see if it was as good as I remembered. The menu calls their veggie burger the “Santa Fe Vegetarian Burger” (the restaurant serves primarily Mexican/southwestern food) and says the patty is made with roasted corn, Anaheim pepper & artichokes. In retrospect, I’m amazed I liked this burger so much as a teenager as I have never cared for artichokes! Everything is mashed together in the patty though, so I didn’t really notice them. 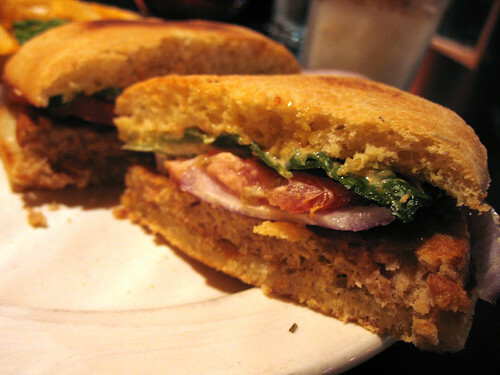 It’s definitely a pre-made patty, but it’s a pretty good one. Must have some soy in it for texture too, as it’s more chicken-like than beef like and holds its shape well. The restaurant told me it’s a vegan patty – no eggs binding it together, even though the default toppings aren’t vegan and they weren’t sure about the bun. The bun was one of the best things I remembered about this burger – a rosemary thyme roll, which proved to taste just as good years later as it did when I first enjoyed it. A nice, sweet and herby complement to the southwestern flavors of the rest of the burger. Yes, it doesn’t seem like that would work as well as it does, but it really tastes great! The toppings include cheddar cheese, lettuce, tomato, onion, and chipotle mayo. I asked for mine without cheese, something I would have never done a couple years ago (I remember it being very good with the cheese) but I am still a sucker for chipotle mayo. It comes with fries or corn on the cob - I opted for the fries. 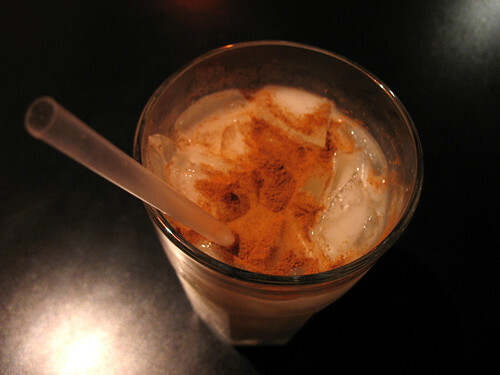 With a tall glass of horchata, of course. So, was it as good as I remembered? Pretty much! 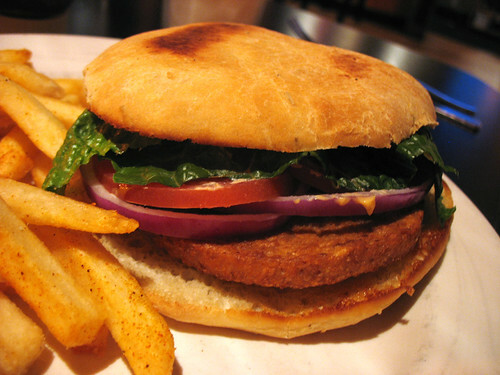 I have to admit, I’ve tried a LOT of different veggie burgers in the intervening years, so my palate is a bit more refined, if you can say that about something like veggie burgers, haha. But it did taste like I remembered – and I enjoyed it. And it gets extra points for that nostalgia factor. It’s nice to know that it hasn’t changed, because maybe some teenage newly-vegetarian kid in rural Virginia is enjoying it now too, and learning that vegetarian food can truly be delicious. Ooooh, that rosemary thyme roll sounds fantastic!